Our product range includes a wide range of fiberglass swimming pools and prefabricated swimming pool. 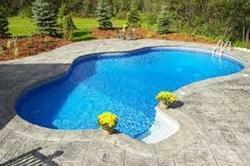 We offer complete range of Fiberglass Swimming Pools. Our range of Fiberglass Swimming Pool is as maintenance free as a pool can be. Today, owning a pool does not have to mean spend the weekends maintaining it, nor does it have to mean unmanageable electricity and chemical bills.